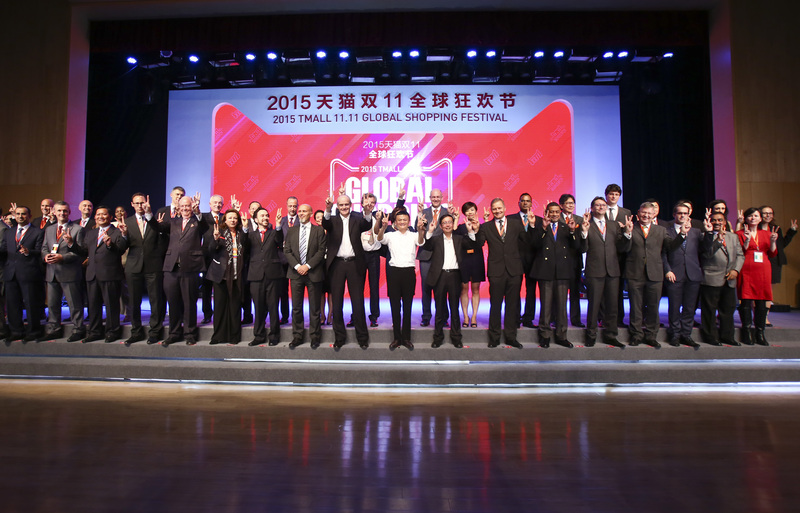 Hangzhou, China, October 13, 2015 – Today, Alibaba Group (NYSE: BABA) officially launched its 2015 11.11 Global Shopping Festival in a ceremony at its Hangzhou, China, headquarters. At the event, Alibaba outlined its international strategy to serve as the "gateway to China" for brands worldwide. Representatives from 39 countries, more than 40 partnering international brands, and nearly 30 fresh food associations from around the world were in attendance. Alibaba Group executives Jack Ma, executive chairman, Daniel Zhang, chief executive officer, and Michael Evans, president, addressed the key priorities and goals of this year's 11.11 festival. With the Chinese consumption economy as the main backdrop and driving force behind the world's largest shopping event, Jack Ma offered his insights and shared his optimism with the audience. "There are currently 300 million middle class in China, and that number will rise to 500 million in 10 to 15 years. This will be an opportunity for every nation," he said. "China's consumption power will rise quickly and that will not only drive China's economy but also the world's economy." Zhang, who was instrumental in creating the first 11.11 sales event in 2009 when he led Tmall.com, said, "Over the past six years, 11.11 has evolved from a marketing event for online shopping into a global phenomenon that involves consumers in China and around the world. This year's 11.11 will focus on four key themes: omni-channel, mobile, logistics and globalization. 11.11 showcases the scalability and power of Alibaba's entire ecosystem. Only Alibaba can deliver a comprehensive e-commerce experience at the scale seen on 11.11, the 24-hour period when the world gets a glimpse into our unmatched infrastructure." With more than 100 global brands, trade associations and country representatives in the audience, Michael Evans, in his first public appearance as president of Alibaba, discussed the company's globalization plan – one of Alibaba Group's key long-term growth strategies and a top priority for the 11.11 shopping festival this year. "Alibaba is already a gateway to China for global brands, and we have a long-term vision for scaling our efforts so businesses of all sizes can tap into the Chinese population who want quality international products," said Evans. "Over the past decade, we measured ourselves by how much we changed China. In the future, we will be judged by how we change the world." This year's 11.11 will bring to life Alibaba's overall globalization strategy that Evans outlined. Hundreds of international brands currently on the Alibaba platform are already seeing significant demand across top-selling categories in China, such as baby and maternity products, apparel, electronics and home appliances, cosmetics, health, grocery, and fresh foods. In addition to international businesses, Alibaba is also partnering with individual countries to facilitate imports directly into China. At the 11.11 launch ceremony, Alibaba and the attending fresh food trade associations agreed to make Alibaba the number-one platform to sell fresh imports from overseas directly to Chinese consumers. Evans also announced at the event that Alibaba Group will be expanding its physical presence in Europe and the U.S., which will involve opening new offices in Italy, France and Germany in the coming months, as well as growing its footprint in the U.K. The 11.11 shopping festival began in 2009 with participation from just 27 merchants as an event for Tmall.com merchants and consumers to raise awareness of the value in online shopping. Six years later, 11.11 has become a global event with participating merchants in the tens of thousands, buyers in the millions, and total sales in the billions.